As Marketing Director for a Microsoft Gold Partner, I’ll admit I am a bit biased towards the solutions Microsoft offers within Office 365. However, having used many Unified Communications tools over the course of my career, I genuinely believe Microsoft Teams is the best solution out there for helping organizations increase productivity and establish effective communication within their environments—not just for marketing, but for every division! However, in this piece I’ll focus specifically on how Microsoft Teams can make an impact on the effectiveness and efficiency of marketing departments. Marketing campaigns require a great deal of planning and communication for effective implementation. It’s important that there are proper tools in place to ensure success by helping facilitate this communication. This is the goal of Microsoft Teams. First off, what is Microsoft Teams exactly? Microsoft Teams is a platform that combines workplace chat, meetings, notes, and attachments. The service integrates with your Office 365 subscription—including Microsoft Office and Skype—and features extensions that can integrate with other useful third-party products. 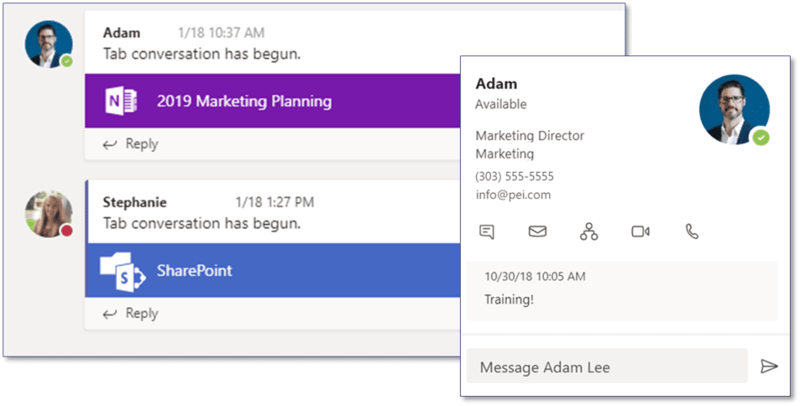 Now let’s look at some of the ways Microsoft Teams can benefit a marketing department—or really any department that relies on communication and creativity. Ready to become a Teams power user? See our Teams training videos to learn the basics and discover pro tips! During campaign brainstorming, marketing team members share and develop ideas to create the foundation of the campaign. With Microsoft Teams, you can start a conversation with multiple team members—even the whole department—to discuss ideas, next steps, planning logistics, and more with only a few clicks. All these conversations are saved and can be reviewed at any time within Microsoft Teams. This can help new team members get up to speed when they jump into campaigns in the middle of the planning process. When you add someone to your team, they can easily go back and review previous discussions. Teams also allows you to communicate in real time. Messages are received instantaneously, removing worries about response time or waiting for someone to get back to you. The teams interface also helps you figure out when the best time to contact someone is. Anywhere a user is active in Teams, their avatar appears next to their contributions. A colleague’s avatar includes their picture and their presence. So when you see a message in Teams you want more information on, you can know immediately if the colleague who posted the message is at their desk and ready for a call. PRO TIP: You can use a colleague’s avatar to start any type of conversation by hovering over it and using their contact card to call, start an instant message, send and email, and more! Microsoft Teams gives you a whole slew of methods for communicating, but it can still be challenging for team members to be creative when they’re on a phone call or communicating through instant messaging. A University of Wisconsin psychologist found in 2010 that test subjects were much more creative when using pen and paper as opposed to sitting in front of a computer keyboard. Unfortunately, with technology connecting business teams from locations across the globe, the option to turn off the computer and work together on a piece of paper isn’t always an option. The next best thing? A virtual paper—or collaboration space. Luckily, Teams comes with all kinds of tools to help creative teams think outside of the box. One of the easiest creative workspaces to spin up is a whiteboard, where your team can draw and write as if you were all in the same room—you guessed it—writing on a whiteboard. In a meeting, your team can bring up a whiteboard in just a few clicks for a meeting space more conducive to brainstorming creative processes. 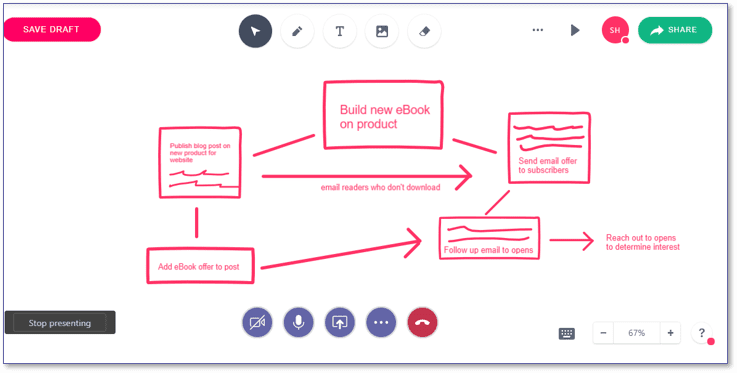 Our team prefers InVision, which lets you combine sketches and text, expand the workspace infinitely, and add your whiteboard to your team to access even when not in a meeting. Here’s a whiteboard our marketing team worked together to build in less than ten minutes. Microsoft Teams is built so content can be streamlined. If there’s a new campaign or product to be marketed, all content—whether spreadsheet, landing page, or sales script for follow up—can be shared through one platform. And, after you share the documents in Microsoft Teams, you can collaborate directly on these files together and in real time. Ensuring all involved parties these campaigns will touch are informed is essential. Once the campaign is live, departments can push content through all channels within Teams so everyone is on the same page. For example, if your sales team is getting push back about a product, they can send this information into Teams. You can have a Feedback Team—or a Feedback Channel in your Marketing Team—where this information is stored. 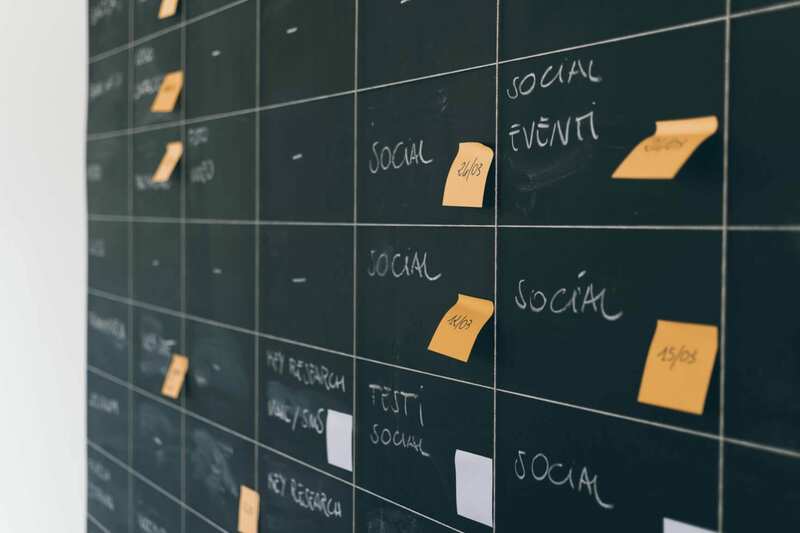 Your marketing personnel can review this information regularly and use the Teams interface to communicate with the product team on potential changes to the product to fit consumer needs or to build objection talking points. Once these objection talking points are built, your marketing team can upload them to the Sales Team, where your sales personnel can access them during calls. Get started with Microsoft Teams today! Contact PEI to learn more about how you Teams can make your organization more efficient. Microsoft Teams allows you to utilize other Office 365 apps. This means you can take advantage of tools like Power BI, Calendar, or Forms in your marketing campaigns. 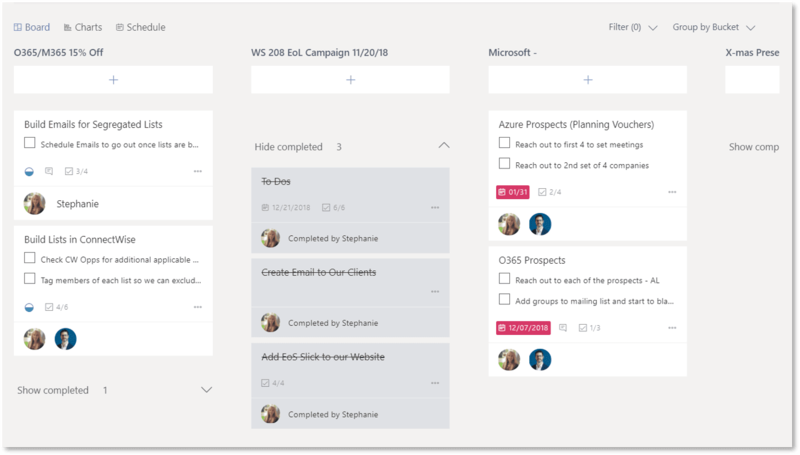 The integration of Microsoft Planner within Office 365 allows for campaign schedules to be organized and visible to everyone. Set tasks for yourself or other team members and track the status of these tasks. The ability to use multiple tools all from Microsoft Teams makes it an extremely powerful solution and brings everything under one roof—making it easier to manage and increasing adoption and productivity. Microsoft Teams allows you to bring in other tools you use regularly and work in one integrated platform for sharing information. This ensures all team members are on the same page and can communicate effectively. Within Teams, each position can share results with the team directly through Teams. Your website manager can integrate Google Analytics to feed daily updates on website performance, so the content writer knows if his or her messaging is effective. 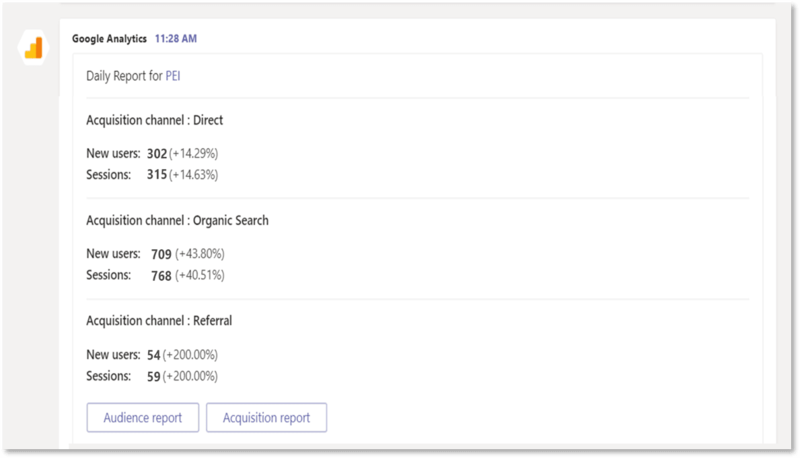 Your email specialist can integrate Mail Chimp or Constant Contact, so you have up-to-date information on open rates, and your copywriter can see the effectiveness of the two different email subjects your team is A-B testing. When your content writer builds new messaging based on this data, he or she can upload it into Teams where your team can discuss the changes and your web developer can grab it to update your website. And all of this happens in one tool. Moving to Microsoft Teams is not a small task. It requires an experienced Microsoft partner to not only strategize, plan, and deploy the solution, but address training and adoption measures as well. PEI helps take you from strategy to adoption. Email me directly if you are interested in learning more!